Michael Gault, Mark McAllister and Matthew Tipton are among five Linfield players who have been released by the club's new manager Warren Feeney. Club captain Gault has played 480 games for the club but Feeney said that he had been unable to agree new terms. "As manager I have to be prepared to take tough decisions when agreement cannot be reached," said Feeney. James Knowles and Kyle McVey have also been released by the Blues. Feeney paid tribute to Gault's "great service" and offered his thanks to the player. Former Dungannon striker McAllister has scored 54 Linfield goals in his five years at the club. "Mark has done well for Linfield and he's been a great servant of the club over the past number of years but I have to make decisions with regard to the future of the club," added Feeney. "I want to wish him all the very best in all he does in the rest of his career." 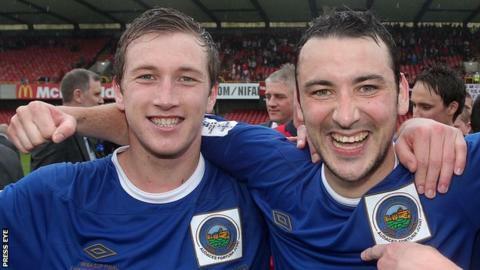 Tipton joined Linfield in May 2012 after starring for Portadown but the Welsh-born forward has been hit by injury since moving to the Windsor Park club. Despite that, Tipton managed a goals return of 20 in his 52 Linfield appearances. The former Portadown striker was put on the transfer list a year ago but then remained at the club last season. Former Coleraine player Kyle McVey made 22 appearances for the Blues after joining the club last August while midfielder Knowles moved to the club from Cliftonville last summer before being sent on loan to Ards in mid-season. BJ Burns has already left the club after agreeing a deal with Crusaders but Aaron Burns has joined Jamie Mulgrew and Peter Thompson in signing contract extensions with the Windsor Park outfit. Elsewhere, Derry GAA star Eoin Bradley has signed a two-year deal with Irish Cup winners Glenavon. The striker played for Coleraine last season. Ballymena United defender Jim Ervin faces a lengthy lay-off with a serious knee injury. The former Linfield full-back limped out of the cup final and it was revealed he had cruciate and medial damage.